A nation-scale firewall, colloquially referred to as the “Great Firewall of China,” implements many different types of censorship and content filtering to control China‘s Internet traffic. However, the filtering does not seem to be perfect. Past work has shown that the firewall occasionally fails. In other words, sometimes clients in China are able to reach blacklisted servers outside of China. This phenomenon has not yet been documented because it is very difficult to find a large and geographically diverse set of clients in China from which to test connectivity. Failures in the firewall occur throughout the entire country without any conspicuous geographical patterns. 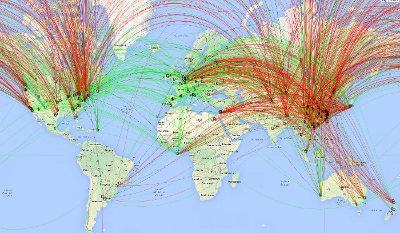 A network block in China appears to have unfiltered access to parts of the Tor network. The filtering seems to be mostly centralized at the level of Internet exchange points. Our work also answers many other open questions about the Great Firewall‘s architecture and implementation. In October 2014, we published a technical report which discusses our preliminary findings. For questions or feedback, please contact Roya using royaen@cs.unm.edu (OpenPGP).